When I knew I was ready to buy a home, I wasn't sure what to expect. After all, I was a first time homebuyer and the thought of making such a large purchase seemed intimidating. So I did what any other first timer would do - I went to see for myself what was out there. Like the diversity in people, so too are the variances in builders and the homes they offer. Detached, attached, suburban, urban, live/work loft, and traditional single-family homes are just some of the options. Even when I narrowed down the type of home and a general location for my first place, I wanted to make sure I was purchasing it from the right builder. My experience with builders was nothing short of interesting. What I learned was that builders each have their own personalities. Some I found to be snooty, others non-responsive, some unwilling to negotiate with me (even with pristine credit), and others just plain felt untrustworthy. Before I thought all hope was lost for a wholesome, honest builder, I discovered MBK Homes. MBK Homes is based in Southern California and is not the largest, and is not the one you hear about the most, however; I came to the conclusion that MBK Homes' values were based on homes with quality craftsmanship and a team of people dedicated to giving me the utmost in customer service (which happens to be extremely important to me). When I approached the MBK Homes sales office in the Greenbrier community of Yorba Linda for the first time, I had a bitter feeling carried over from dealing with some of the other new homebuilders. I have to admit that I came in believing that builders were not to be trusted, they had little integrity, and were not upfront or honest. I was pleasantly surprised when I first walked through their model homes, which quickly appealed to me and I convinced myself to give MBK Homes an opportunity to change my perceptions. And that's when I met Sheril Alexandre. Sheril was immediately different than any other new home salesperson I'd met before. Sheril walked me through each and every detail of the homebuying purchase process with MBK Homes. I must have asked over 100 questions (I'm not kidding) regarding the contract, community, construction, financing, options, etc. Each and every one was answered on the spot and if she didn't have the answer right then and there, I never waited more than one day for an answer. Regarding MBK Homes' standard 1-year home warranty, I was skeptical about how quickly my service requests would be answered, so Sheril personally introduced me to the customer service representative who would be managing my requests. I was able to speak openly with him and ask my questions directly. When I had requests about the construction process and standards, I was introduced to the MBK Homes' construction superintendent who answered each question, in addition to those posed by my inquisitive parents. When we ultimately decided to purchase the home after such a great experience, Sheril worked with me to prepare a great deal. My first homebuying experience was very pleasant because of MBK Homes. Everyone I met during the process was friendly, hospitable and made my very important life decision so much more enjoyable. Of all the builders around Southern California (and I've interacted with most, if not all of them), MBK Homes is by far the most customer service oriented builder and, for me, that is what counts when I'm making such an important lifelong purchase. As an added bonus, the MBK homes I selected from were built with true quality and floorplans that really felt livable. The home I chose gave me flexibility to accommodate my own special living needs and I have thoroughly enjoyed all of the options that MBK Homes offers. While I love my home at the Greenbrier community, I know MBK Homes offers many other quality communities in California and I recommend them to all of my friends, co-workers and family members. I cannot wait to make a lifetime of memories in my new MBK home! 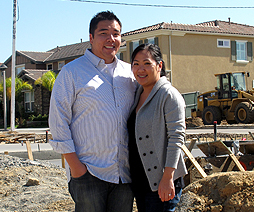 Bryant Tam is a first time homebuyer at Greenbrier, a MBK Homes' community in Yorba Linda, Calif.